Every woman needs a signature recipe. One that gets asked for over and over again - one that is taken to dinner party after dinner party and barbecue after barbecue - one that always seems to disappear, without any leftovers. 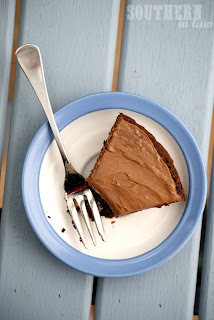 This chocolate cake has been a favourite of mine for quite some time - I first made it over a year ago and fell in love - and no other chocolate cake has ever been able to top it. Even the most decadent, butter filled, sugar laden cakes - and that's saying something. 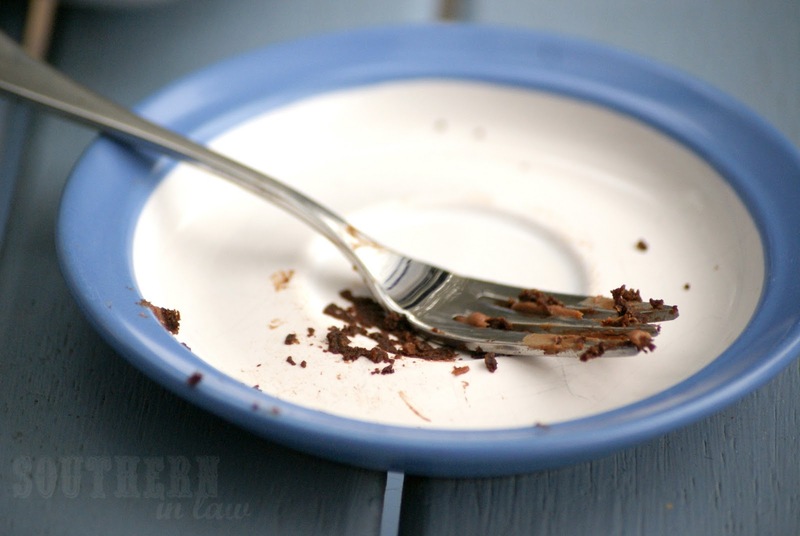 Best of all, this chocolate cake is a one bowl recipe and is so simple you could make it even if you had one arm, one eye and only 4 fingers (just as long as you had a thumb!). But it's a cake that has been requested over and over and loved by my family and friends - even the Flamingo Pink girls fell in love with it! 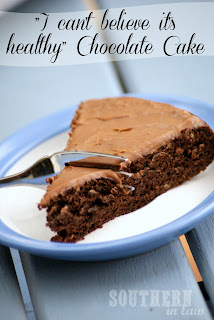 Would you believe me when I told you this drool worthy chocolate cake has no butter? or oil? or chocolate? or that it's vegan? and absolutely no funky ingredients like beans or flours that will cost you a fortune? Probably not.. and don't worry, no one else did either. 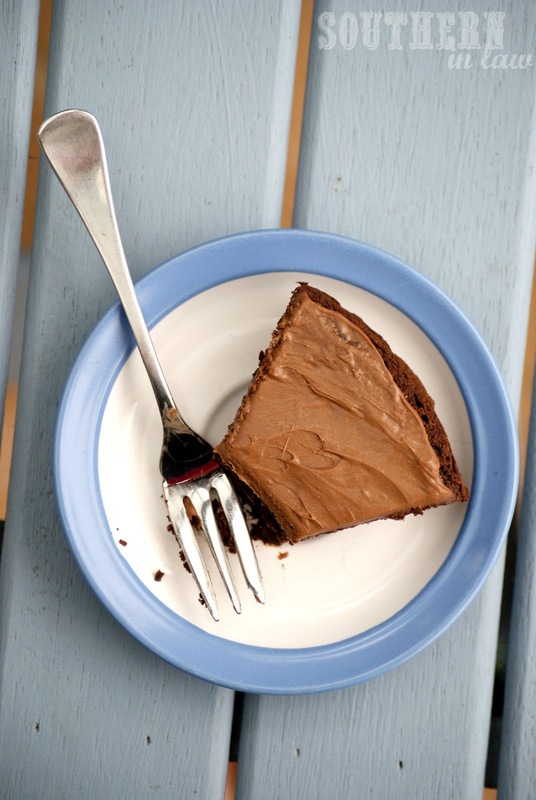 In fact, I first made this recipe for family and friends at a dinner party - I was running low on ingredients, but new I could whip up a quick chocolate cake with what I had in the pantry. I was nervous that everyone would hate it, even though I could eat an entire cake myself (it's that good) - but when it came time for dessert, all of a sudden people started asking. Kerri said "oh Kristy, your blog is so healthy - but what are you doing to us with these decadent desserts?! Forget my workout this morning.. this is going straight to my thighs" - Michelle begged me for the recipe, John ate 2 slices and Cheryl all of a sudden became a chocolate cake fan. This cake even turned my Mum into a fan of sweets - and she never eats dessert! In fact, when photographing this cake - she took that slice up above and walked past Jesse saying "nerr nerrr, look what I've got!" 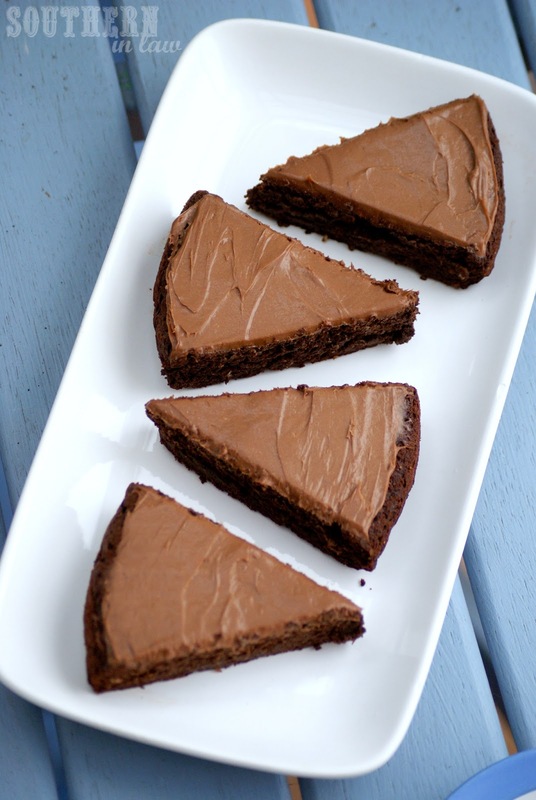 This makes a small amount of frosting as the cake doesn't need much, but for a full batch - see this Vegan Chocolate Frosting recipe. Note: if your mix is not wet enough, add in some milk or water until it reaches a thick cake batter consistency. Your climate/temperature/flour etc can all contribute to differences in consistency so use your best judgement! For the frosting, cream the butter and sugar until light and fluffy in a mixer, adding in the cocoa and vanilla and mixing until combined. If needed, add a couple of drops of milk/non dairy milk until your desired consistency is reached. **Cheats Tip: Try Cadbury Philadelphia for a super quick and easy frosting. I usually only use about half of a small 140g tub but a little goes a long way! Just don't be surprised when there's no left overs (and don't worry, after this photo was taken - that fork was licked clean). A double batch is definitely a must do. Tell me, what's your signature recipe? and what's your favourite type of cake? Love this cake? 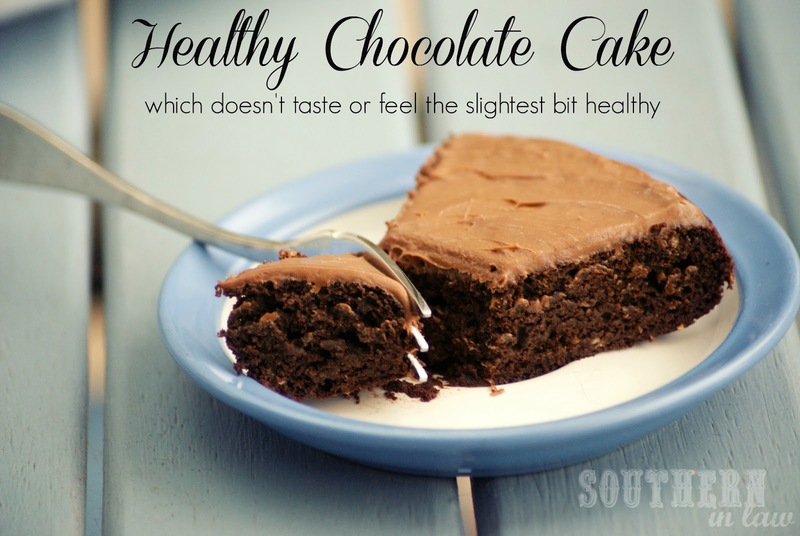 Be sure to try our Healthy Chocolate Fudge Cake too! Oh don't worry, before perfecting this recipe I tried many many horrible combinations. Most of them were too dry, too "healthy" tasting or just not enjoyable at all. 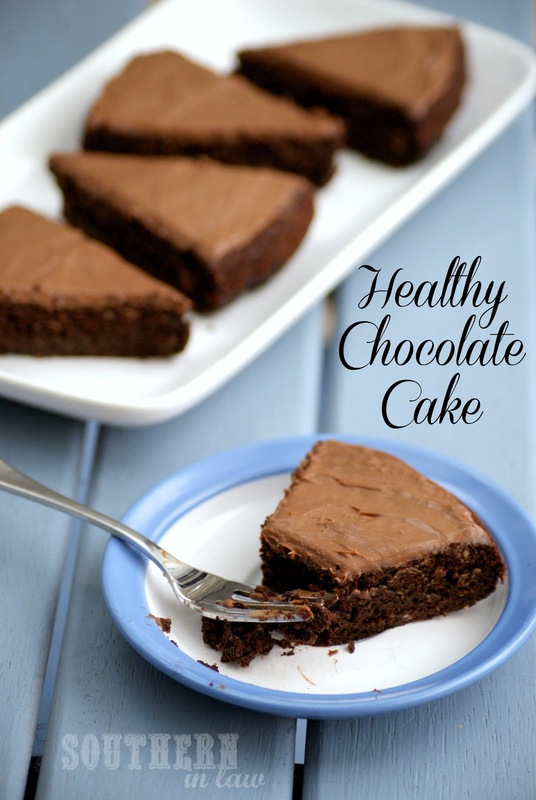 Definitely give this one a try as it's delicious - and doesn't taste the slightest bit healthy! oh i forgot to ask! so you make your own Vanilla? i have done and it is amazing!!!! i much prefer the flavour than mass prodcuced stuff! I haven't made my own vanilla before - but it is something that's on my to-do list! Do you have a recipe? Yum, thanks for sharing the recipe, looks delicious! Thank you, lovely! It is absolutely amazing - we seriously make it at least once a fortnight and as soon as it's gone, Jesse's asking for it again haha. Mmmm, I'm so intrigued by this cake! Though we only have sweetened applesauce here, so I'd have to make my own or omit the sugar. is this a 9 x 9 pan? Great recipe and amazing blog!!! I made this cake last night for my daughter's third birthday. I used a fluffy white frosting recipe because she asked for white frosting. It has eggs, but we just avoid dairy and soy, so that was fine for us. It was a great combo. The cake was delish and I love how healthy it is. I found the batter to be not as liquidy as I'm used to with cake batters. I combined the wet ingredients (and refrigerated) about 2 hours before mixing with the dry. But since this was just vanilla, applesauce and sugar, it seems like it shouldn't have effected the batter. The cake was not dry, but I would not have minded it if it was a touch more moist. Thoughts? Should I use more applesauce next time? I'm so glad your liked the cake! As the recipe says, there are a lot of factors which can influence the consistency of your cake batter - how you measured your flour (putting flour into the measuring cup or using the cup as a scoop), the altitude where you are, the temperature/humidity etc. if your batter seems a little bit dry (and this goes for any recipe) just add in a touch of milk/water until it reaches a smoother consistency. I wouldn't suggest adding anymore applesauce just as it could make the cake a little gummy. Thanks for replying. You absolutely addressed this in the recipe and I completely missed it. OOps. I think it will be even better next time. I did add a wee bit of oil (maybe 1 or 1.5 tsp) because it was right on the counter from greasing the pan, but water makes a lot more sense!! As for measuring flour, do you recommend putting it into the cup over scooping it, or is it just personal preference? Usually I scoop it into the cup - just so you're not compacting the flour and actually putting more than a cup (sounds ridiculous but it can make a huge difference). Generally speaking, I test recipes both ways to see if it makes that much of a difference - and if it does, I'll put the ingredients in grams instead - with flour though I find it tends to make more of a difference with your climate/humidity and also how old or what type of flour you're using. Hi! Question about the "1/3C unrefined cane sugar/brown sugar" is that use both or one or the other? Trying this out for a birthday cake and wanna get it right!! Thanks!! If you'd like it to be a little sweeter, I'd suggest 1/2C but we like it the way it is! It looks deliciously healthy! :) I decorated it with some fresh strawberries since my husband loves those and invited some friends over for a decadent dessert party! Love the fact that it is made out of whole grain flour and has no dairy in it! Thanks for this wonderful recipe.. Where can I share the picture? Ooh how fun! I hope you love it! THIS IS THE BEST CAKE EVER. It's the first fluffy desert I've made that's both vegan and GF. I used Sprouted Jack's pancake mix (http://mindfulmealsonline.com/sprouted-jack-pancakes/) as the flour, and it just came out splendidly. Wow. Thank you! If you use pancake mix do you omit any of the making powder/soda? If you're using gluten free pancake mix, still use the baking powder/soda just as you can never have too much raising agents in gluten free baking - if you're using a wheat pancake mix you can leave it out. Also, make sure your pancake mix doesn't have any added sugar/sweetener or you might want to adjust the sugar content. I just made this today because I have to bring a dessert to my sister's house tomorrow. Good thing I doubled the recipe and made two!! I also doubled the full frosting recipe and halved it to frost each cake. I did only use 1 3/4 confectioner's sugar for the doubled frosting - it was enough. Thanks!!! It was awesome!! Didnt turn out great. Not sure what happened. I took your advice and didnt compact the flower. It seemed to cook and look normal, but it didnt have much of a taste, and cooled to the consistency of a semi dry brownie. I added more a tiny bit more liquid because the batter seemed too thick. Pared with the frosting I made (not your recipe but I should have because it would have been better) the cake just wasn't good. It wasn't terrible. It just wasn't great! I shall try again this holiday baking season!! That is really odd, Jon! We just made four batches of this cake this weekend and they were perfect - there is one thing I've noticed though - you have to get really good tasting cocoa powder. Different brands have a different flavour - bland cocoa powder totally ruins a cake! Humm I'll try that next time. I used my go to Nestlé but maybe I'll try some else! Thanks for that tip!! I'll let you know how the second go round turns out! Hi Amy, you could definitely try a mix of both - it may just be a little crumbly from the oat flour. I haven't tried oat flour in this, but I've used it in many of our other recipes and it worked fine - so you'll have to let me know how it goes! Have you ever tried using this recipe for chocolate cupcakes? My two year old foster son has a birthday this weekend and we are dairy and gluten free. We've had the cake before and he loves it. For his birthday, I'd like to do cupcakes and not a cake. Any experience? I most certainly have! We've made this recipe into cupcakes many many times! You just need to reduce your baking time - it will vary depending on the size so it may be anywhere between 10-20 minutes. These were amazing! I made them into mini muffins and skipped the frosting. I had to eat 1 or 2 before I fell in love. I'm so use to cakes and muffins being so sweet it took my taste buds a bit to conform to the less sweetness, but it didn't take long. Do you have any idea if we can freeze these?? I'm due for baby 2 on Feb 4th and looking for recipes to bake and freeze a couple of months before due date. Thanks for sharing these recipes with us! You can certainly freeze them - we make big batches in muffin tins and freeze them to defrost and eat as we want to - they never last too long, but I did have one batch that was hidden at the back of the fridge for over 6 months and it was perfectly fine! Hi just wondering if there's a reason why the flour options are listed as 1/4+1/8 why not just 3/8? Hi! Can I subsitute the sugar for honey? Can you bake this cake in a Bunt pan? This cake was amazing! I would have never guessed applesauce would taste so good in chocolate cake. I modified it a little, added a bit extra cocoa powder and maybe 1 or 2 tablespoons of butter. I didn't need it to be vegan just less fattening and sugary than usual cake. You will have to try out Fudgy Chocolate Cake as well (http://www.southerninlaw.com/2013/10/healthy-chocolate-fudge-cake-recipe.html) as it might be more your style too! We've never added butter to this cake, but I'm glad it turned out well! But a little flat, in the 10 inch round pan I used. I think next time I wil make cupcakes instead. Just made this and added 50 ml of HOT coffee. It was amazing, so moist:) Can´t believe it´s healthy! I'm trying a vegan diet for a month (Veganuary), but I had a serious craving for chocolate this week, so I decided to look for a vegan chocolate cake that would make my day and seriously - this cake definitely did! It's a-ma-zing! And you were right, I should've made a double batch! Thank you for this recipe.